High performance tension control is a relatively new concept in composites manufacturing. However, it is the critical component in unlocking the next level of automated, continuous, high quality and high volume manufacturing that will be required as the demand for composites grows. We have designed a variety of tension control solutions perfectly suited to the unique variables found in composites manufacturing. We are composites tension control specialists and have been able to provide our knowledge and expertise to our customers, as conference speakers at events such as CAMX, as well as contribute articles to JEC and CompositesWorld magazines. Achieve automated processing, continuous production, higher end product quality, reduced scrap, and increased productivity. When running multiple webs; varying tension on each of the strands of material can create a variety of problems, such as delamination, stretching, uneven coating, etc; all adding up to reduced quality and increased scrap. Adding closed loop tension control to each individual tow/roving is often not a cost effective solution. Whether you run just a few webs, or hundreds, we have modified our nip technology to produce a cost effective, drop in unit capable of delivering high performance automated tension control on each of your webs. Our Modular Automated Tensioners (MAT) are designed for multi tow/roving applications to provide consistent, precise tension control on each individual web of material. When installed right after creel payout, or directly before material processing the MAT ensures each web of material is at the same and exact tension level you set. For example if the MAT is installed directly before a resin bath, the MAT ensures each web gets a precise, uniform and consistent coating before processing. MAT’s can be customized to meet the exact needs of your machine. Increase product quality, consistency and profitability with our Multi Tow Tension Control. By accurately controlling tension on carrier sheets for unwind/payout and rewind/take up, we have added automated and continuous production to a variety of hand lay applications. 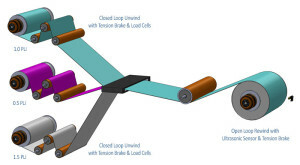 Integrating a closed loop tension control system involving tension brakes, load cells and a tension controller is often a simple process that delivers an immediate return on investment through numerous productivity increases. Add consistency, automation and performance to your hand lay application with a Montalvo Tension Control Upgrade. Different types of materials have different required tension levels for optimal processing. When laminating different webs of materials it is critical to ensure each web is at its precise tension level to avoid potential defects and scrap. For example, if film layer is run too tight it will neck down, and will not completely cover the other layers. There is also a possibility that the film will try to relax after being wound into the finished product, creating wrinkles, or delamination. If a fiberglass layer isn’t run at precise tension you run the risk of running the web too tight causing discoloration, breaking or delamination. Our precise, accurate, tension control maximizes the quality of your lamination process while allowing for increased production speeds, reduced scrap, and continuous production. Composites manufacturing requires precise, consistent, high quality tension control to ensure you end up with high quality product. We manufacture a wide range of high quality, high performance products for composite converting applications. Our tension control products easily integrate into existing machinery to give you immediate productivity increases. We have been working with a variety of converting applications for over 67 years, and pride ourselves not just in our industry leading products, but also the service, and support you need. We are here for you.